Königssee is a spectacular lake in southern Bavaria bordering the Berchtesgaden National Park. It is near a number of other popular attractions such as the Eagles Nest and the town of Berchtesgaden itself. With steep mountains rising on both sides, this lake is the deepest (192m) in Germany and was carved out during the last ice age. In the middle of the lake, is the St. Bartholomä Monestery. It can only be reached by boat, or a long hike over the mountains on this side of the river. Due to its depth, the lake rarely freezes completely, however it does occasionally during especially cold winters. When it does, it is possible to walk over the frozen surface to St. Bartholomä. Tours of the lake on electric powered boats can be purchased and have various stop off points along the lake. 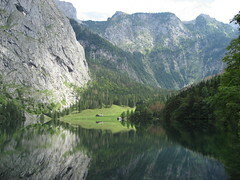 At the far end of Königssee is a separate lake, the Obersee, which can be reached with a short walk from the Salet drop off point. This lake is normally perfectly still due to the high mountains around it, which reflect in its water. Be the first to write a review about the Königssee! See below for more information. Have you already visited the Königssee? If so, let everyone know what you thought about it by writing a review! No registration necessary. Just click here to start writing!